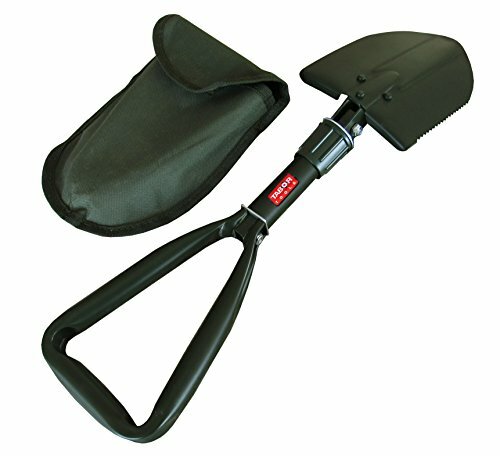 The mini folding shovel is an ultra-lightweight, smart multi-function, super compact tool suitable for many gardening and outdoor activities. When you need to move sand, dirt, or snow, a shovel is the best hand tools to have. The triangular handle is strong and fits comfortably in either hand. The shovel folds twice. It is made to be compact in size when folded so it can easily be packed on a camping or beach trip or carried out to the garden. The military-style entrenching shovel can be used either straight or at a 90 degree angle. It comes in a convenient carrying pouch with a loop so the shovel may attach to a belt or backpack. Made of strong tempered forged steel, the shovel measures 18" long when unfolded, include a serrated on one side of the blade so it can be used to saw off lightweight branches. The blade with teeth can be used for cutting and slashing. The folding shovel can be used to dig tires out of dirt if a car becomes stuck. These tools also make mini snow shovels for digging tires out of snow banks. You will find many uses for your new folding shovel! MULTI-FUNCTIONAL. This super-compact e-tool is suitable for camping, hiking, adventure, garden, and other outdoor activities. Can be used as an extraction shovel for SUV 4X4 off-road vehicles. The military-style entrenching shovel can be used either straight or at a 90° angle. It comes in a convenient carrying pouch with a loop, so the shovel can be attached to a belt or backpack. Weighs only 1.3 lb. SERRATED EDGE DESIGN. The sharpened edge is for digging and the serrated saw edge cuts through roots, compost, mud, sand and snow. This tool can dig tires out of dirt if your car becomes stuck. Overall length when unfolded is 19" providing plenty leverage for tough digging. LIGHT-WEIGHT AND PORTABLE: You can fold up the shovel twice into a small portable package. When completely collapsed, this shovel fits into a 6" by 8" green carrying bag. It fits in the glove box, so you can keep it in your car, backpack or toolbox; this tool will get you out of any tight situation! DURABLE MATERIALS: both the hardened steel shovel and the pouch are made of durable military-grade materials which are here to stay!